KAPAʻAU, Hawaiʻi - The public was invited to attend the ballfield naming ceremony, and watch Takata throw out the first pitch. 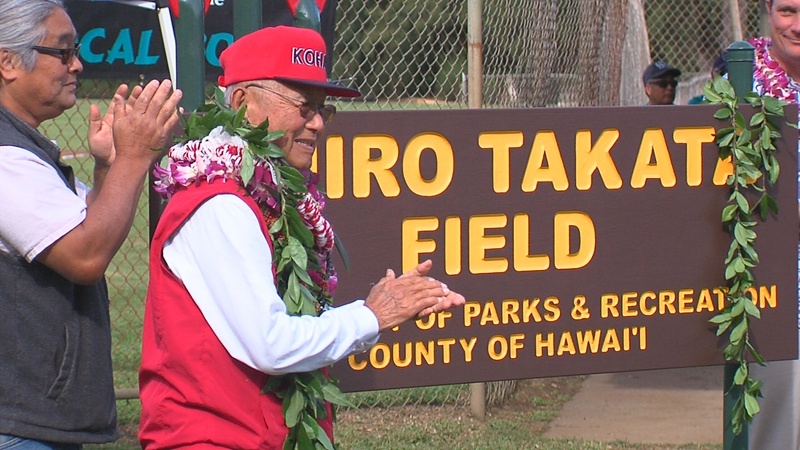 (BIVN) – Shiro Takata Field at Kamehameha Park in North Kohala was dedicated on Saturday. The public was invited to attend the event, which involved speeches, a new sign unveiling, and a first pitch thrown by Takata himself. Last year, Kohala councilman Tim Richards brought forward a bill to honor Takata with the ballfield naming. The purpose of this ordinance is to name the baseball diamond and football field at Kamehameha Park in North Kohala, “Shiro Takata Field.” The field is located at 54- 382 Kamehameha Park Road, Kapa`au, Hawai`i 96755, at Tax Map Key( 3) 5-4-005: 016. Shiro’ s support has taken many forms. He has provided personal computers for the elementary school computer lab, secured additional funds for classroom improvements, purchased playground equipment for the kindergarten class at Kohala Elementary School, and funded student travel to the annual Math Bowl which is held on our neighbor islands. An avid sportsman, Shiro Takata also made it possible for many young people in North Kohala to participate in recreational programs and activities. In 1980, Shiro was instrumental in establishing the Kohala Community Athletic Association (KCAA) which provides student athletes financial support. On average, KCAA helps cover the costs of participation in sports activities for 400 student athletes per year.